The leaf of the olive tree has been known by traditional herbalists since biblical times. Modern research shows olive leaf contains unique flavonoids including oleuropein, which has several valuable properties for protecting cardiovascular tissues, maintaining normal glucose tolerance, and inhibiting aspects of microbial metabolism. 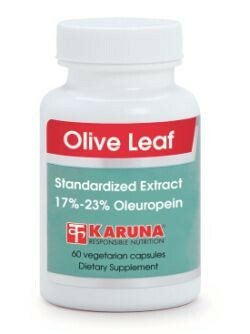 Karuna's Olive Leaf Extract is standardized for a high 17% to 23% oleuropein content. Olive leaf extract (Olea europaea) helps support normal blood pressure (J Pharm Belg 1996;51:69-71) and protects LDL cholesterol from oxidation (Life Sciences 1994;55:1965-71). Olive leaf extract's constituents combine synergistically as potent antioxidants with greater activity than vitamins C and E; in addition, its components oleuropein and hydroxytyrosol have shown a broad action against several aspects of microbial metabolism (Food Chem 2000;68:457-62). Clinical trials clearly show olive leaf extract to be orally bioavailable (J Nutr 2002;132:409-17). Animal studies have identified potentially useful blood-sugar regulating activity of olive leaf extract (J Pharm Pharmacol 1999; 51:1305-12).